Our opening meeting of the year was very well attended, with more than 40 members and guests in attendance. Sarah Pollman gave a stimulating presentation titled “Image as Metaphor: Creating Projects with Deeper Meaning”. She talked about her development and process as a fine art photographer, illustrated with examples of several of her own projects. Sarah closed out the presentation with a series of text slides outlining some aspects of conceiving and executing a body of work - a cohesive project. She has graciously shared those slides for download at the link below. Guest speaker David 'Stoney' Stone kicked off 2018 with an inspiring presentation on smartphone photography at our January 9 meeting. His richly illustrated talk demonstrated the 'art of the possible' with this ubiquitous tool, reinforcing the notion that the best camera is the one you have ready to use. Stoney talked about some of the apps he uses both for greater control of initial image capture and for post-processing right on the phone. His own phone photography almost never goes to the computer! Below is a list of some of the apps Stoney mentioned in his talk. Most (if not all) are available for both iPhone and Android phones. Search by name to learn more about them and find the version for your phone. We had the pleasure of hosting Collette Pelletier, whose company represents Moab and Legion papers, as the speaker for our November 14 meeting. Collette gave an informative presentation on photographic inkjet printing papers. She described the different manufacturing processes used to make the papers, and the advantages and disadvantages of alpha cellulose vs. cotton rag vs. metallic bases. She discussed in detail the differences in appearance and typical uses for papers with different surface finishes. Moreover, she passed around sample photographs printed on a number of papers in Moab's line, including the Entrada cotton rag paper with a matte finish, the Juniper cotton rag paper with a baryta semi-gloss finish, and the Slickrock metallic finish paper. Collette was accompanied by a representative from Hunt's Camera, who had brought a good selection of Moab paper for sale at a discount, including sample packs, many of which were purchased by members at the end of the meeting. 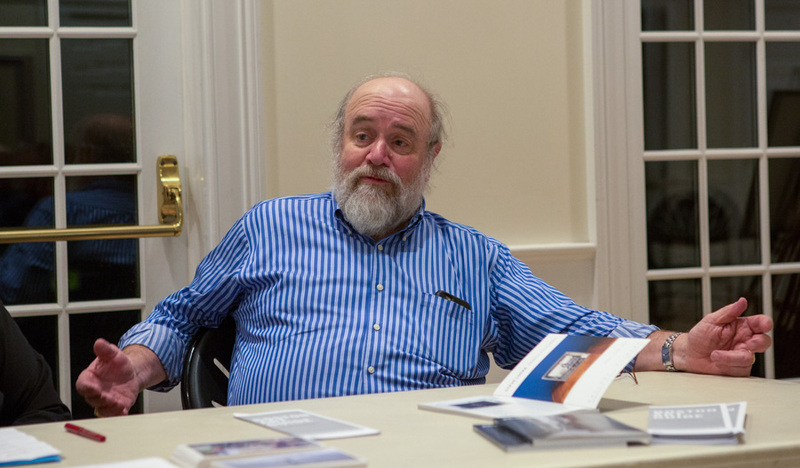 We had a terrific first speaker of the 2017 - 2018 season, David Wells, who gave an excellent presentation on Travel Photography to a packed house. Based in Providence, Rhode Island, David is an award-winning photographer who is a two-time Fulbright Fellow, and whose work has appeared in National Geographic, Fortune, and the Sunday New York Times, among many others. There's a lot more information and resources at his web site davidhwells.com. David gave us a detailed rundown on how he approaches travel photography, how he handles different lighting, angle of view, lens selection, finding "choke points", working with people, and much more. He left a "cheat sheet" with lots of helpful information and links, including information about his workshops. Click to download the "cheat sheet". Lance Keimig was the featured speaker at our May 9 meeting. Lance is a highly regarded photographer and educator specializing in Night Photography. Several of our members had taken with workshops with him and recommended him as a speaker, and we're glad they did! There was a great turnout for the meeting - we kept having to bring out more chairs. Lance first talked about the history of night photography, showing a series of images from the earliest practitioners of the art and describing how it has evolved along with the development of new equipment. Next up were images to illustrate the aesthetics of the genre, the special contrasts and colors you can only get at night. Then on to the equipment needed for night photography - recommendations in regard to tripods, lenses, flashlights (for seeing your camera controls and for light painting) and more. Lance then covered the procedures, including preparation, exposure and other camera settings, key details like when to use long exposure noise reduction, and high ISO exposure testing. He talked about the characteristics of the kinds of light sources you are likely to encounter in the field at night, both natural and artificial and their effects on images and implications for white balance. All in all it was an extremely stimulating and informative evening and was well received by the attendees. For more information about night photography, Lance Keimig, and his workshops, visit www.thenightskye.com. Go the Downloads link where you can access a pdf on the history of night photography along with other useful information. Lance is also one of five photographers who comprise National Parks at Night. The web site is well worth a visit, and they offer an interesting blog on various aspects of night photography. The November 29th monthly general meeting was a bit of a departure from our format. Rather than the usual digital projection, we were fortunate to have Arlette and Gus Kayafas from Gallery Kayafas bring out framed original prints from their personal collection and discuss them with us. As collectors, Arlette and Gus are second to none and have donated thousands of prints to several major museums. They also are current overseers of the deCordova Sculpture Park and Museum. Gallery Kayafas opened in 2002 and is one of the premier art galleries in the Boston area. It was named Best of Boston by Boston Magazine in 2013 and 2015 and by Improper Bostonian in 2016. What makes Gallery Kayafas special is both that its prime focus is photography and that the work shown must be creations that Arlette and Gus feel strongly about and would own for themselves. The gallery is the result of their desire to share their large collection, which they have been accumulating for almost 50 years. The main feature of the evening was a 'show and tell' of eleven of their favorite works from that collection. These pictures normally hang on the walls of their own home and it was a special event for them to make the trip to Bedford. Gus and Arlette were kind (and brave) enough to bring originals so we could immerse ourselves in the full experience of the works. They were all displayed on easels and at the end of the discussion we were able to examine the pieces up close. Ten of the photographs were black and whites by such luminaries as August Sander, Minor White, Aaron Siskind, Harry Callahan, Diane Arbus and Peter Kayafas, their son, whose work is in major collections and museums. The sole color image was Harold ‘Doc’ Edgerton’s iconic shot of a bullet cutting a playing card in half. You can see the complete list of what they brought at the bottom of this post. Each is worthy of your exploration online. Almost all these pieces were personally given by the artist to Arlette and Gus, usually in some form of trade. We got to hear the stories of how these works entered their collection. All of the work was impactful, but for many the highlight was August Sander’s piece, My Wife in Joy and Sorrow. The image was taken in 1911 of his wife holding their twin children just after birth. The overwhelming aspect of the piece is that one of the babies was stillborn. The picture itself is emotionally wrenching but as challenging is the simple idea that Sander could conceive and execute the picture in such a moment. While the clear highlight of the evening was the detailed discussion of each of the pieces, Arlette also covered several broader topics of interest to the group including how to start as collectors and how to approach galleries as artists. Though they have one of the largest private collections of significant photographs, Arlette emphasized that each picture is a collection unto itself and that every one of us can and should be a collector. The goal should not be to have a “collection” but to have images that you enjoy looking at, that move you. Share amongst ourselves. As she pointed out, we are good photographers so if we like each others’ work, we should find a way to do some “horse trading”. Go to galleries. Every type of gallery we can think of. You never know what you’re going to find. Go to auctions. While a lot of auctions have high priced items, many others feature up-and-coming new artists. In particular, charity auctions are a great place to start, with MassArt’s annual April auction being one example. Of course, a lot of us are also very interested in having our own work shown in galleries and other venues. Arlette pointed out that probably the most important thing is to get known. The art world is hard to break into and you need to work at it to succeed. Perhaps not surprisingly, her advice on this topic wasn’t much different from that about collecting: go to galleries to see what’s out there and meet people, submit work to shows and auctions, etc. Don’t walk in cold to a gallery and try to show work to the owner. Develop relationships. Subscribe to Photograph Magazine (http://photographmag.com/) as a resource for finding galleries and what’s going on. 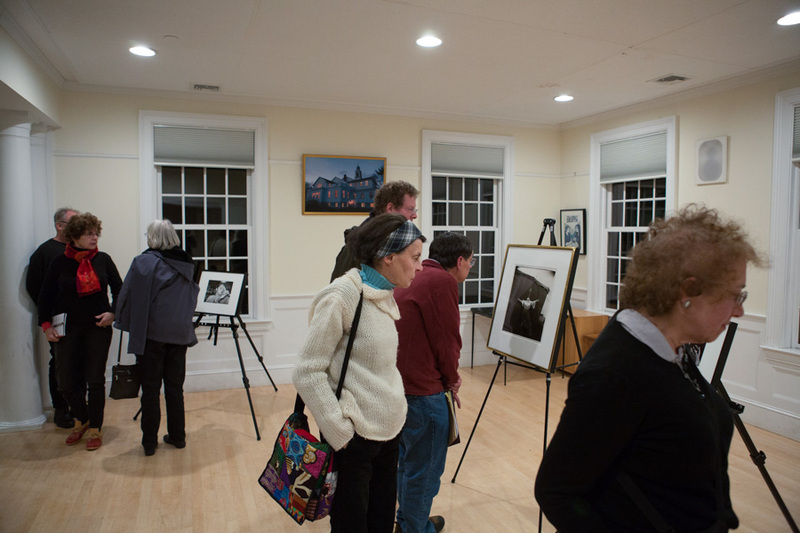 Get to know people at local venues that welcome new artists, such as the Griffin Museum of Photography in Winchester and the Photographic Resource Center (PRC) at BU. When you do have a chance to show your work to gallery owners or critiquers, be prepared. The person will want to know who you are and what you’re trying to say. You should do this in 10-15 images that can stand alone but that also work together to tell your story. We are truly grateful to both Arlette and Gus for coming out to the “burbs”. It was a full evening of experience and information and was very well received. We had over 50 attendees, one of our larger meetings ever. If you enjoyed this type of presentation, please let us know and we’ll plan for more like this in the future. We are excited to host Bryan Peterson for a day-long seminar. Bryan is a successful commercial photographer whose clients include American Express, Kodak, UPS, Phillips and Citibank. He has received awards from the Communication Arts Photography Annual seven times, Print Magazine four times and has also won the prestigious New York Art Directors Gold Award. He has also served as a contributing editor at Popular Photography and Outdoor Photographer magazines. Bryan is the co-founder of the Perfect Picture School of Photography, the world’s number one on-line photography school. You may remember Amy Giese led a fantastically informative session at our final Photo Group critique meeting last spring. We ended up discussing not only the content of the images, but also what members were aiming for when they took the shots, and how we make our decisions about the subjects and style of our photographs. We are very pleased that Amy has agreed to offer a one-day workshop on this topic. We need a minimum of 10 people to sign up, and are limited by space considerations to a maximum of 20 participants. Hello everyone, well we are coming into what I would call the "brown season" from a landscape photography point of view. The colors are gone, the leaves have fallen, and what do we do with the photographs that lack color and interest as is? Turn them into black and white!